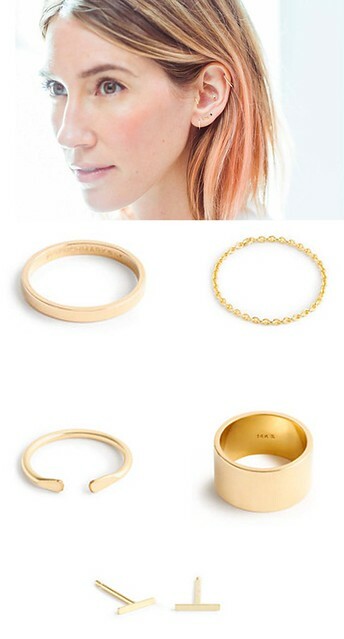 I’m so excited for my dear friend Caroline Ventura, designer and maker of of Brvtvs jewelry. Her latest collaboration is with JCrew. She did a stunning collection of rings and the most perfect bar earrings. I’ve been Caroline’s biggest fan since the moment I met her. She’s a true talent and one of the most kind hearted people I know. I’m lucky enough to be able to use her as a model from time to time if I need to do an illustration of someone stunning in a certain pose. If I were getting married again, this gold ring would be my wedding band without a doubt. I currently wear these bar earrings, and this Claudia necklace nearly every single day. Check out JCrew’s feature on Caroline.